My mind is going a million miles an hour right now, but I want to post, since I won't be around all next week. 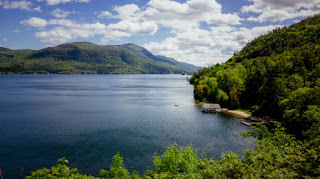 :O Yesterday a friend of mine invited the kids and I to join her and her kids for a week near Lake George, NY! So we're leaving in a couple days. Today and tomorrow will be spent doing all the laundry and packing so we can leave at sunrise for the 10+ hour drive. I have one invincible goldfish left. Actually, he's some sort of tetra, but he's gold in color. I've taken all of the gravel out of the aquarium, trying to eliminate the black hair algae. Now that I'll be gone for a week, the fish will just get fed and have to live with the yuck. I'll launch a new plan of attack after we get back. Like I said, my head is still sort of spinning. I'm a planner, and this flying-by-the-seat-of-my-pants in two days is sort of disconcerting. Have you watched Gravity Falls? My kids are loving it. It's on Hulu, but it looks like it's six years old or so. I'm surprised no one ever mentioned it before. Last night we rented Ready Player One from the Redbox. While Jack didn't really watch it (which surprises me, since he LOVES video game stuff), the rest of us enjoyed it. Of course now I'm on the library's list to borrow the book for my Kindle. I'm #110 in line, so don't hold your breath for that review. We're putt-putt golfing this afternoon, but we'll probably head to the library after that for our road trip tradition - a couple audio books for the drive. Now that Maggie is big enough for the front seat, she can't watch movies, and I certainly don't want the kids playing their darn phone games for that long each way of our drive. Just wait til you see my list of books read in July - I've been a reading machine! I think I'm at four or five so far, and starting another one today! Good news! I forgot to eat my leftover pizza for breakfast, so now I know what I'm having for lunch! We were going to have pizza and a movie on Saturday, but hubby had a hankering for it last night, so we swapped last night's sloppy joes for Saturday instead. I am definitely all over the place, and feeling spread thin, but I'm sure a week of vacation will reset all of that. Enjoy your week! Enjoy your vacation Becki!!! Have a fun and safe time! I *loved* Ready Player One - both the book and the movie. The movie was fabulous on the big screen and has a lot of homages in it to other Spielberg movies and classics. The book was very good too ... I'm not sure which one I enjoyed more, actually. I haven't played Putt putt in years, sounds like fun. My husband saw Ready player One in the theater and really enjoyed it. I don't think it's a movie for me though. I wish I could give you some suggestions for games on the phone but I've never played any on mine.